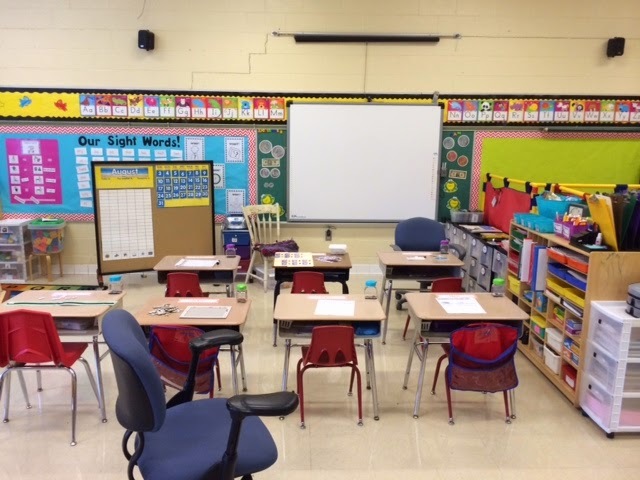 2014-2015 School Year: Classroom Tour! Happy 2014-2015 school year! Look at that, I found some time (and wine) to sit down and blog! 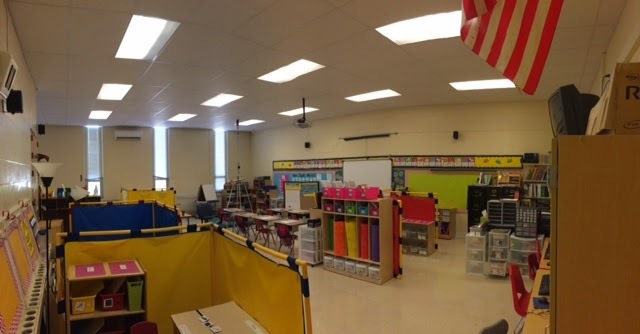 I wanted to give a little "tour" and inside look of our classroom this year! As a teacher of students with moderate to intensive needs, it's always quite the puzzle putting together my room. I must say, this is definitely my favorite setup to date! Love love LOVE it! So I go back to school in July and this is what I find: all of that? That's my stuff. All stacked down the hall outside my classroom. That was not fun. HOWEVER...it made classroom set up a little easier! In previous years I found myself just moving stuff around to place things in the room. This year I started with a blank canvas! This is what you see when you walk in my door. 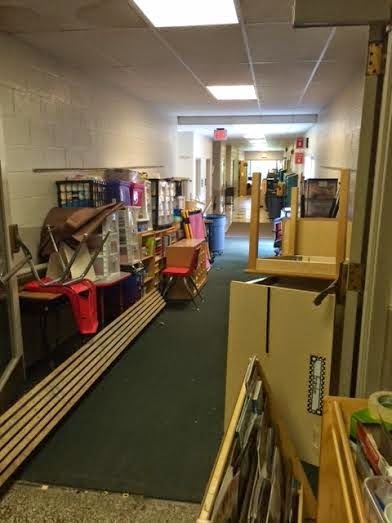 My classroom is divided up into multiple small areas. As a moderate to intensive needs teacher, much of my time working with students is 1:1 work. To decrease distractions, my students have their own "office" area. I have 7 students and 5 "offices" (1 student is slowly moving out of my classroom, and another came to me the day before school started, so she gets to share one for the sake of my sanity). Below is some more information about their office areas and the 1:1 work I do with them! 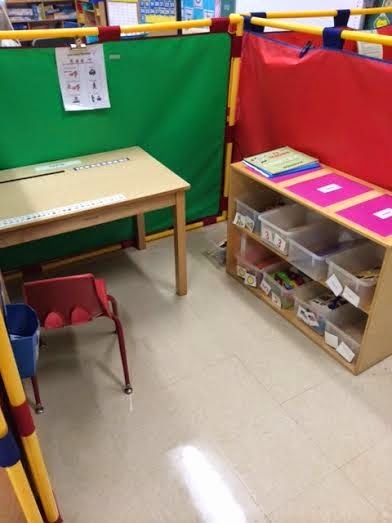 Here is just one of my kiddos "office" areas. In here, you will find independent bins filled with work that is mastered. This is done with the TEACCH method during their independent work time. 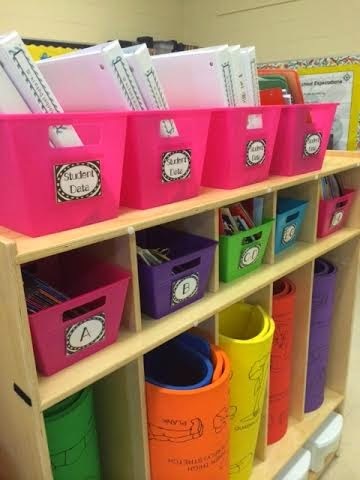 You can also find reinforcers such as first/then cards, schedules, calm down checklists, etc. Last year each student had their own rolling cart. However, I'm trying something new this year to help my sanity (why do I need a full set of time flashcards for each office?!?) and to make things a little easier. All of our rolling carts are now lined up, filled, and labeled. 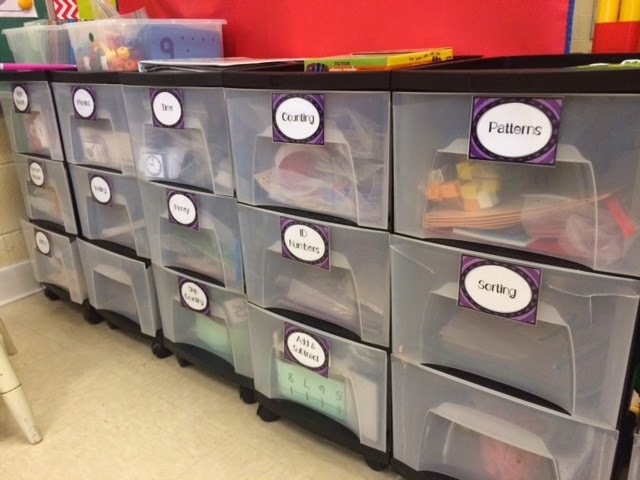 When I work 1:1 with a student, or if I have one of my paraprofessionals work with someone, we can just grab some sight words, flashcards, or counting manipulatives and take them to that student's office to get to work! Voila! The desks are also making transitions SO much more manageable. Last year, we would come back from Art or Lunch and there would just be kiddos running everywhere. 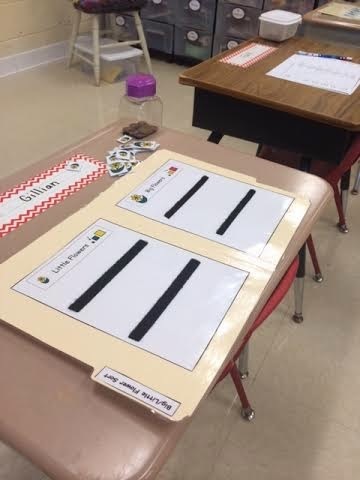 This year, each transition involves us sitting at our desk and waiting on instructions from the teacher. We are also able to do morning bell work while everyone gets situated first thing in the morning. You can see some morning work pictured above, ready to be completed before we do lunch count and morning group! Above are a couple more pictures of "areas" in my classroom. We have a computer area, play area (with a swing, finally!!!! 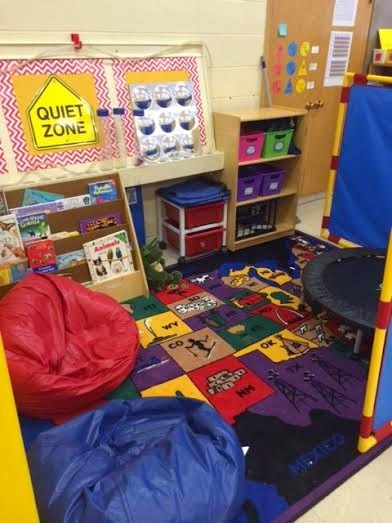 ), and sensory/quiet area. The quiet area is my new addition and favorite part of the new setup. 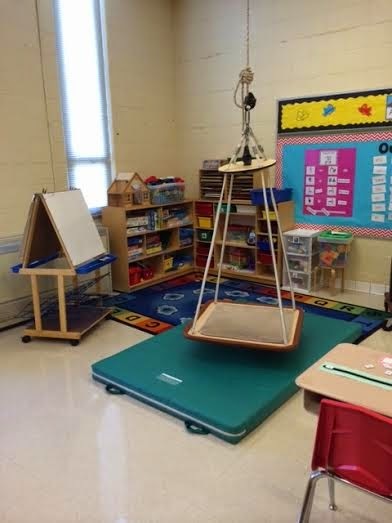 We have some weighted vests, a weighted blanket, fidget toys, a trampoline, and some beanbags and books to help out with calm down or quiet times. I have my students come back from transition and sit at the desk too to wait on instruction. 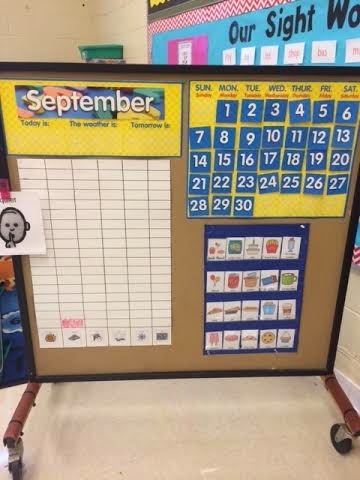 I understand the idea of 'check schedule' but I also think it's good for students with disabilities to take direction that may vary from day to day ( and it teaches them to sit & wait...which is sooo hard!) 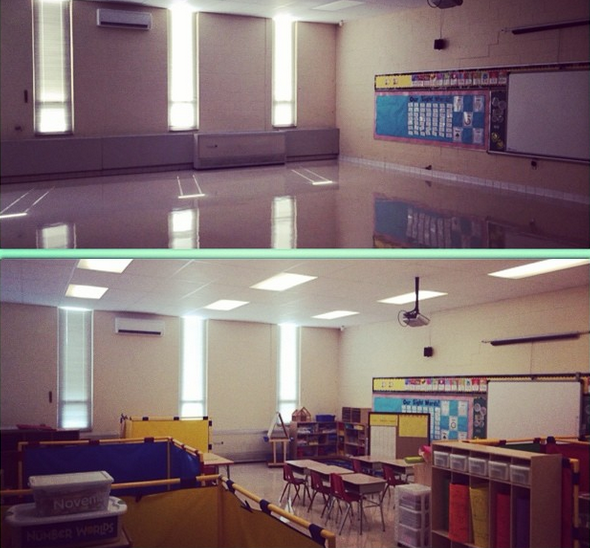 :) Love your classroom! I love your swing! I wish my district would allow me to have one like that! We have to have one that has a self standing frame and they are so ginormous I wouldn't get anything else in my classroom. Oh well, I'll just keep drooling over yours! Room looks great! I've had it for the last 2 years and FINALLY got maintenance to hang it this year! Took a lot of fighting and one maintenance man to hate me. ;-) haha but thank you!! I just found your blog and I am enjoying it. What ages do you teach? 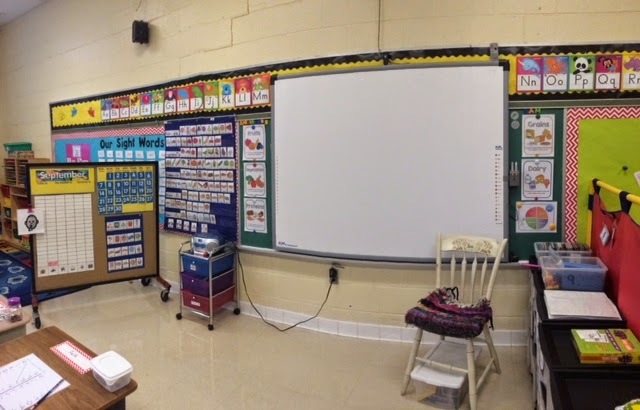 I love your classroom set up. My kids are older and I struggle with keeping it age appropriate for ages 10-19. 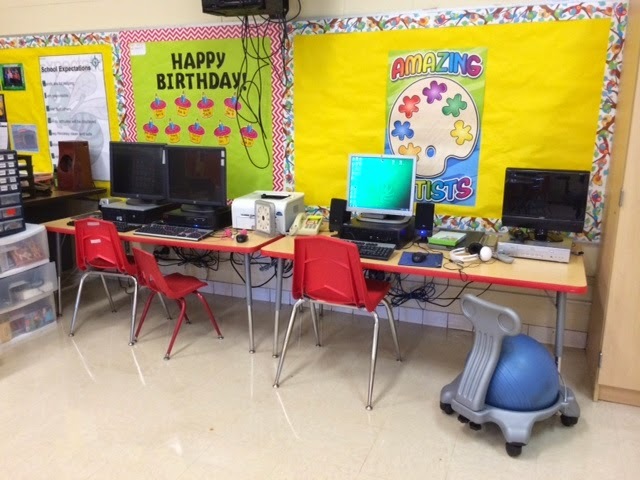 I am starting out with 15 desks (the number of students) this year for the same reason you stated. I have a second classroom with tables also to divide the kids up to work with myself and the paras. Thanks for sharing! Hey Heather! I teach K-5 (last year I had all grades K-4!). Thanks!! I finally found a set up that I loved last year. Desks are a serious LIFE SAVER. Never going back! !